All fiat currencies eventually die a death of hyperinflation. This much has been established throughout history. There is a very fundamental reason for this: fiat money brings out the worst in human nature. When this fraudulent system ends, it is highly likely that everyone will rush back to the money that has been used for millenia; money that cannot be loaned into existence by bankers, printed at will by government or stored in the trillions as ones and zeros on a computer. This ancient money is gold and silver – sound, honest, real money. If the world switched back to the gold standard today, there would be about a third of an ounce of gold and about a seventh of an ounce of silver for every person on earth. Currently, you can get a third of an ounce of gold for a little over $500. However, the global wealth is around $34000 per person, implying that a person who owns $5000 of gold today would be able to buy $340000 worth of assets if we return to a gold-backed currency system again. The internet is spreading the understanding about the unsustainability of our current fiat currencies and the cconomic system they have created all over the world. Currently, only 1 or 2% of Americans and Europeans own physical precious metals. As more and more people wake up to these facts and start buying real money in order to preserve their purchasing power, massive shortages will develop and the price will skyrocket. It used to be that the precious metals market was reserved exclusively for the West. Now, however, millions of Asian investors also have the required purchasing power to get their hands on the tiny little pile of precious metals on earth. More people wanting fewer resources always leads to much higher prices. 5. What else is there? Just like there are lots of reasons to own physical gold and silver, there are just as many reasons to cut down on everything else. Stocks are incredibly risky in the current economic environment, real estate bubbles have been building and popping violently throughout the world, fiat currencies cannot be trusted and even government bonds are losing face simply because the governments of several western economies are actually insolvent. Precious metals really is all that is left. 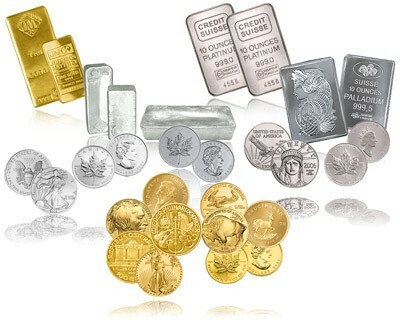 Buying physical gold and silver is very easy nowadays. Many online services are available (e.g. Goldmoney.com) where you buy the physical metal and pay the company a small fee to store it securely in a vault for you. Alternatively, you can also buy bullion coins from a local dealer and keep them in a safe place somewhere close by. So, get your hands on some gold and silver and sleep just a little easier in these times of unprecedented economic uncertainty. Asians are definitely not new to to the bullion market. Sorry, I have made the subconscious mistake of writing “Asia” while thinking “China”. I sincerely apologize for this bad lapse on my part. The point about Asia (China) in this blog post was based on the information that the private possession of gold in China was outlawed until 2002 (see http://www.noblecoins.com/Gold-and-Silver-Investment/Gold-investment/china-promoting-buying-of-gold.html for example), but now China is buying incredible amounts of gold both through government and private investors. This is one of the primary arguments that Mike Maloney (the guy in the above video) regularly makes for buying physical gold and silver. A quick internet search also suggests that the holding of gold bars was also prohibited in India before 1990 (http://info.goldavenue.com/Info_site/in_mark/in_ma_in_i.htm). People could accumulate gold in the form of jewelry, but it seems like free bullion investment must have been difficult in those years. Thanks for sharing the link to this post with me, you hit it dead on! I have been telling people for the past few years that our paper money is worthless, it isn’t even worth the cotton its printed on, the real value is what the money gets you, the goods. Precious metals will always be valuable and if we could go back to the gold standard we would be heading back in the right direction. With the current debt status of our government and inflation getting out of control it is very possible that precious metals such as gold, silver, and copper will be our currency just as it was in the past where the money was made of these metals. The only reason I believe the stock market is still a good option is the more money you make, the more metals you can buy, it is smart to buy some every month and store it while values increase. The sad thing is our government is always going to be trying these wacky ideas to save the dollar but its slowly heading to disaster. Buy what you can while you can before its too late. I’m just concerned about the very large number of people that are totally oblivious to these seemingly obvious facts. About 99% of the developed world don’t own any physical gold and silver to preserve their purchasing power, own very few other real assets and are neck-deep in debt. They are therefore highly vulnerable both to inflation and deflation of our fiat currencies and will be hit very hard when we eventually transition to a different system. Large groups of very unhappy people can do all sorts of irrational and unproductive things. I just hope that we manage to make the required transition without any serious social ramifications. A saying that I tell people all them time when we are talking about fixing things, “a person is smart, people are dumb”. Either no one knows what kind of trouble we are in or they just choose to ignore it hoping it will fix itself, we need an organized group of people that have a plan that will work, the group then needs to properly recruit people from all over the nation to join them in the fight against corrupt politicians, and to fix the failing economy. What do you think about Ron Paul?